You might see a 4-year-old boy forming words using 3-dimensional letters called “the movable alphabet.” A 2½ -year-old may be sitting by a teacher, ever-so-carefully pouring water from 1 tiny pitcher to another. Several children kneeling on the floor may be intently struggling over a puzzle map of South America. Montessori teachers make a point to handle Montessori materials slowly, respectfully, and carefully, as if they were made of gold. The children naturally sense something magical about these beautiful learning objects. As children carry their learning materials carefully with 2 hands and do their very special “work” with them, they may feel like they are simply playing games with their friends—but they are actually learning in a brilliantly designed curriculum that takes them, 1 step at a time, and according to a predetermined sequence, through concepts of increasing complexity. Each learning material teaches just 1 skill or concept at a time. For example, we know that young children need to learn how to button buttons and tie bows. Dr. Montessori designed “dressing frames” for children to practice on. The frame removes all distractions and simplifies the child’s task. The child sees a simple wooden frame with 2 flaps of fabric—1 with 5 buttonholes and 1 with 5 large buttons. His task is obvious. If he makes an error, his error is obvious. Built-in “control of error” in many of the Montessori materials allows the child to determine if he has done the exercise correctly. A teacher never has to correct his work. He can try again, ask another child for help, or go to a teacher for suggestions if the work doesn’t look quite right. Materials contain multiple levels of challenge and can be used repeatedly at different developmental levels. A special set of 10 blocks of graduated sizes called “the pink tower” may be used just for stacking; combined with “the brown stair” for comparison; or used with construction paper to trace, cut, and make a paper design. The pink tower, and many other Montessori materials, can also be used by older children to study perspective and measurement. Montessori materials use real objects and actions to translate abstract ideas into concrete form. For example, the decimal system is basic to understanding math. Montessori materials represent the decimal system through enticing, pearl-sized golden beads. Loose golden beads represent ones. Little wire rods hold sets of 10 golden beads—the 10-bar. Sets of 10 rods are wired together to make flats of 100 golden beads—the hundred square. Sets of 10 flats are wired together to make cubes of 1,000 golden beads—the thousand cube. Children have many activities exploring the workings of these quantities. They build a solid inner physical understanding of the decimal system that will stay with them throughout school and life. Later, because materials contain multiple levels of challenge, the beads can be used to introduce geometry. The unit is a point; the 10-bar is a line; the hundred square a surface; the thousand cube, a solid. Montessori learning materials are ingeniously designed to allow children to work independently with very little introduction or help. The students are empowered to come into the environment, choose their own work, use it appropriately, and put it away without help. Maria Montessori believed that moving and learning were inseparable. The child must involve her entire body and use all her senses in the process of learning. She needs opportunities built into the learning process for looking, listening, smelling, touching, tasting, and moving her body. When you look at Montessori materials, you are drawn to explore them with your senses. For example, you would want to pick up the sound cylinders and shake them. They consist of 2 matched sets of wooden cylinders containing varying substances that create different sounds when shaken. The child sorts the sound cylinders using only his listening skill. Two cylinders have the barely audible sound of sand. Two have the slightly louder sound of rice inside them. Others contain beans or items that sound louder still. After matching the cylinders, the child can grade the cylinders—that is, put the cylinders in order of softest to loudest, or loudest to softest. Montessori materials are designed to follow the students throughout their education; they are like familiar faces greeting them in their new classrooms as they advance. For example, exploring the “binomial cube”—made up of 8 red, black, and blue cubes and prisms—the early childhood student develops visual discrimination of color and form. The elementary child labels the parts to explore, concretely, the algebraic formula (a+b)3. The upper elementary child uses the binomial cube as the foundation for work with more advanced materials to solve algebraic equations. Montessori-structured lessons are the “work” or procedures for each set of materials. A teacher may give a lesson to a child or small group of children, another child may give a lesson, a child may learn how a lesson works by watching others, or a child may explore certain types of materials freely. For a young child, the Montessori-structured lesson may be silent and may be only a few moments long. This lesson models a method for laying work on a mat or table in an orderly fashion. The lesson helps children develop work habits, organization skills, and general thinking strategy, but it never teaches children the answers. 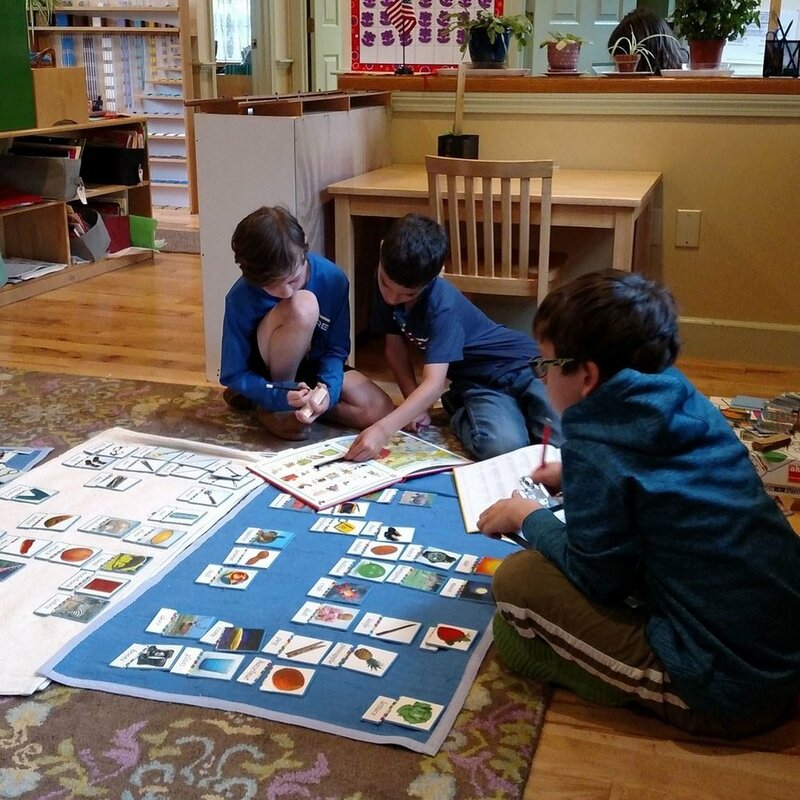 For students of every age, the Montessori environment offers the tools to discover the answers to their own questions. The teacher is their trusted ally and the learning materials are their tools for discovery, growth, and development. The teacher stays with the students for the entire span of their multi-age grouping, usually 2 or 3 years, nurturing each child’s development over that extended span of time. Elementary and high school materials build on the earlier Montessori materials foundation. Because older students have built a solid foundation from their concrete learning, they move gracefully into abstract thinking, which transforms their learning. Now they learn how to carry out research. At these upper levels, students broaden their focus to include the community and beyond. They learn through service and firsthand experience. The Montessori materials support responsible interactive learning and discovery.